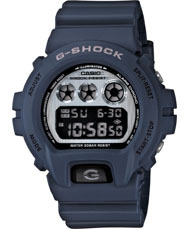 This new collection of G-Shocks feature something new and something old...well, not really old. The DW6900HM models feature a brushed treatment to the dial plate for a retro-vintage look and the DW6900MR features a metallic mirror-like dial and a shiny metal front button which are two great looks that'll be sure to get noticed. Matte navy resin band digital watch with mirror face.